I've created this post to track our community ads as they appear on other sites. The answers can be used for proposing new designs, the highest voted one will go on other sites (manually edited in place of the ones we already have on other sites). Feel free to make site specific ads as well. Currently all the ads are posted created by myself, and I'll edit them if a new ad becomes more popular. Also feel free to leave constructive criticism in the comments. On either of these lists, please upvote our ads to make sure they appear. Please keep in mind that ads should be relevant to the community they're posted in. Don't go spamming random websites. Community ads on X Stack Exchange are for topics that are of interest to the X community. 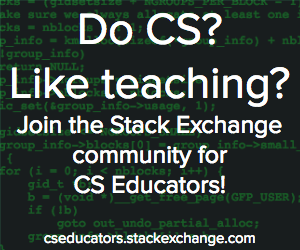 If computer science education is not relevant to X, then don't advertise on X Stack Exchange. 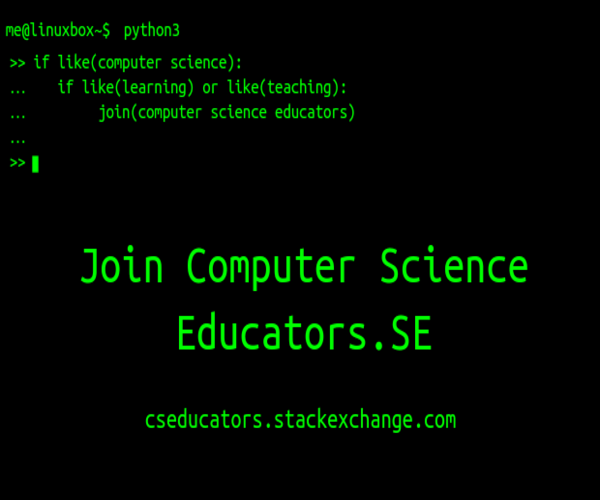 If computer science education is relevant to X, then make an ad that showcases CSE.SE from the point of view of the X community. For an example of how to do it right, look at Literature — note how several sites have a variation on the same graphic design, but with a quote that's tailored to each community. Another example which sometimes stretches relevance a bit thin is IoT.